Squirrels and robins are a common sight on almost any college campus. But is the park-like landscape of a campus actually a good habitat for wildlife? How many other species live in the fields, forests and waters of a university campus? Faculty and students at Georgia Southern University have just completed a two-year study to answer these questions. The study, organized by biology professors Michelle Cawthorn, Ph.D., Ray Chandler, Ph.D., Lance McBrayer, Ph.D., and Jamie Roberts, Ph.D., was funded by the University’s Center for Sustainability (CfS). 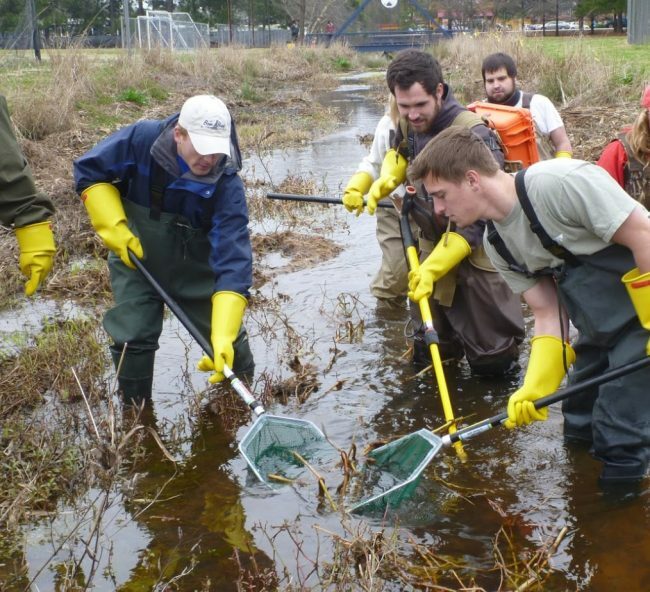 With the help of dozens of students, the scientists observed, live-trapped, netted, audio-recorded or photographed 207 species of vertebrates (fish, amphibians, reptiles, birds and mammals) on the Georgia Southern University campus. This impressive diversity includes 19 species of fish, 19 amphibians, 24 reptiles, 126 birds and 19 mammals. Because the study mapped the location of every animal found, future construction and other development can be done in a way that minimizes impacts on biodiversity. There are educational benefits as well because a biodiverse campus is a living laboratory that students and faculty can use just by walking outside their building. The results of the survey are available to anyone through the iNaturalist website or smartphone application. The project, titled “Georgia Southern Biological Survey,” includes a list of all the species observed, a map of where individuals were seen, and documentary photos for most of the species. An important feature of the application is that anyone on campus can add to the data. “If you encounter a vertebrate on campus, you can snap a photo with your smartphone, go to the application and upload your sighting,” said Rebecca Scott, the biology graduate student who created the site for the project. “This type of citizen science is a great way to engage students and the community in gathering important biological data,” added Roberts. The Georgia Southern Biological Survey is among the most comprehensive of any university in the country, and it is unique in the state. To read the full study, visit https://www.inaturalist.org/projects/georgia-southern-biological-survey.